I can’t remember how old I was when my parents decided that television viewing was not a suitable activity for young children and the TV disappeared from the house. I must have been at infants school but I had already had the exciting experience of seeing my letter to Junior Points of View displayed and read out on the programme! I had put in a special request to “Make Sooty Longer”. This was in the days before special effects so the BBC’s response was to stretch out a drawing of Sooty which clearly wasn’t what I was after. I do remember being quite pleased at the time mind you! How I wish I could find this clip in the BBC archive! The upshot of the disappearance of the TV was that my sister and I just spent more time at our friends’ houses than at home so that we didn’t miss all the important stuff … Blue Peter, Bewitched, Top of The Pops, Alias Smith & Jones etc. I got fed up of being asked at school “did you see?” and having to reply “we don’t have television”. Thankfully the grown ups finally relented when I was about 14 and a TV graced the corner of the living room once again. You may wonder where this is going. Well, the lack of television meant that we listened to the radio and my childhood was filled with The Archers, Down Your Way, Gardeners’ Question Time, Letter from America and – most importantly for the purposes of this post – Desert Island Discs. I’ve remained a fan of the radio and still listen to some of these programmes. Desert Island Discs always sets me thinking what music I would choose but that usually ends up making me emotional because the choices often remind me of my dad. Even the theme music to the programme can bring tears to my eyes! So, I thought I’d change the theme and go for Desert Island Patterns! If I was marooned on a desert island what patterns would I pick that I would be happy to stick with for what might be a very long time? Obviously I would need to have been washed up with a sewing machine and fabric but I’m happy to go with some artistic licence here. When I mentioned this idea to Mr Jane-Makes he thought eight patterns was probably too many for an on-going blog series so I’ll see how I go. He likes to think of himself as my editor. Let’s start with #1 today, although the choices will be in no particular order. 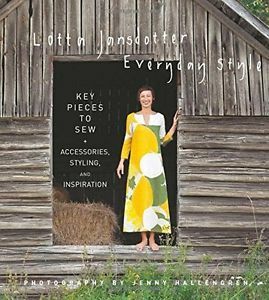 This has to be the Esme Dress pattern which is included in the excellent and inspiring book by Lotta Jansdotter. I received this book as a gift from my sister and although the Esme is the only pattern I’ve used so far I do enjoy flicking through it and I’m sure I’ll try some of the other patterns eventually. To be absolutely honest I did try the Pilvi Jacket but I somehow traced the pattern off incorrectly and the toile ended up in the bin! I will have another go. I’ve made several versions of the dress and I’ve had so many compliments on the bright green one. I could probably live in the denim version. The Esme is so comfortable and dresses make getting ready in the morning so much easier. There isn’t a sleeveless version of the dress in the book but I’ve made two striped versions sans sleeves which were perfect in the June heatwave. I just edged the armhole with bias binding. There’s no zip or other fastenings to worry about and it’s a great pattern to show off a dramatic print. There’s a bust dart and a neck facing and that’s it. The pattern comes with patch pockets and I’ve also added in-seam pockets as an alternative. 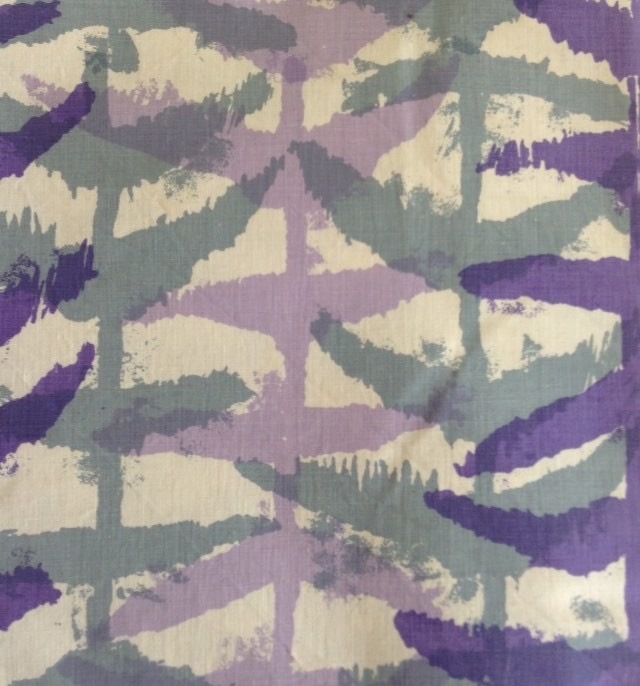 It works particularly well with the curtain remnants I like to pick up and my good friend @vintage_charity is gifting me a piece of this charity shop find which will be perfect. There’s also a top version of the pattern. I’ve made one so far and have more planned, including a sleeveless one. Three of these dresses were made last year and are currently in the alterations pile because they are now too big. They may end up being refashioned into something else – or the charity shop may benefit. Either way, they will be replaced by more Esmes and this pattern will definitely be in the lifeboat! Going back to televisions for a moment … my grandparents were also television-free but succumbed to the small screen in their later years and were completely converted. I couldn’t believe that my discerning grandfather could be found watching soap operas! My mother is also a big fan of the TV these days and is currently working her way through Netflix! Don’t forget it’s the next meeting of the Chi Stitch – the Chichester sewing group run by The Draper’s Daughter and me – this Wednesday, 9 August. We’ll be at St George’s Church in Cleveland Road from 7.00 – 9.00 pm. I’ll be baking tomorrow night and there might be Nutella involved! I haven’t decided what I’ll be sewing but I might be finishing off yet another (curtain fabric) Esme which I started last night. If not, I have another non-garment related sewing project in my head which I might make a start on. « How many mistakes ….. I love the whole concept of this post and I love your various Esme dresses. They do show a print very well. Like most North American children I suspect, I watched way too much television through my childhood and youth. That seems to have “cured” me, however, as I haven’t watched tv much for years, even though tv is going through a new renaissance. I find the national radio much more comforting and interesting, for some reason, so I often have it on for favourite programs. I thought you would probably be a fan of the radio Stephanie. I too find it comforting, especially late in the evening. I don’t watch much TV and if Mr J-M is away I never even turn it on. That’s a neat idea, desert island patterns. Hope you had a great night. We did thank you! We had a good turnout despite the pouring rain! I love the idea of Desert Island Patterns – although Dessert Islands and Patterns may be even better! Could I ask if you have any apron patterns you can recommend? I am planning on making some Christmas presents,I do try to start early every year, perhaps I may manage it this year! Hello Pamela. Thanks for your comment. This is a link to some useful ideas – with free patterns. I have made one of their adjustable aprons and the instructions are really well written with lots of photos! https://www.purlsoho.com/create/tag/aprons/ Happy apron sewing! Thanks Jane. Now looking forward to reading about the next Desert Island Pattern! This post stirs up so many memories! Not having a television for ages, watching banned itv at a friend’s house (especially Bewitched), Junior Points of View – what a great programme and idea, and the sadness that music evokes. The curtain remnant from your friend is beautiful – look forward to seeing what you do with it. It sounds like we had very similar viewing experiences as children. We loved Bewitched and my sister was also a fan of I Dream of Jeannie. Top of the Pops was usually watched on our elderly neighbour’s ancient TV which was black and white with the most terrible picture! The Esme dress is a winner! I love your makes – nice handiwork! Thanks Linda! I’m just finishing the hem on another Esme and will then be focusing on Desert Island Pattern #2. I love this idea of desert island patterns – would you mind if I used it myself on my blog sometime? Your sewing group in Chichester sounds so wonderful, I wish I had something like that near me – maybe I should start one myself! I love all your Esme’s but particularly the stripey one! Hi Kathryn. So glad you like my Desert Island Patterns idea – do please use it on your own blog! We’re so pleased at how well the new sewing group is going. You should definitely think about starting your own. If there isn’t anything already set up in your area I’m sure it would be popular. I grew up in communist Romania (brig out the tiny violins 🙂 ) so we only had about 2 hours of TV a day, and they were filled with the Comrade’s speeches or a patriotic film. But I binge watched TV after the revolution in ’89 when we got cable, so much so that I don’t really care about TV at all now. We have one, but when my husband is away, I hardly ever switch it on. But I LOVE radio, that is the one thing I could not live without now. I’m a 5 Live kinda girl though! I have never listened to Radio 4 though I have heard of Desert Island Discs (and I just googled the specifics). I think I will need live sport or any kind of live radio, instead of music! And the luxury must be the sewing room!! And a fitting book, or maybe a pattern drafting book, I would have a lot of time to play with that, ha ha! This is a fantastic idea and I would love to borrow it too if you don’t mind!! Very lovely Esmes too! I particularly like the black and the red (I’m not a pattern lover in general) and I so like the little detail of the brooches! Hi Alex. Your childhood television viewing doesn’t sound like much fun so I’m not surprised you binge watched it when you had the chance! So glad you are a radio fan too – and that you now know all about Desert Island Discs! Of course you can borrow the idea!